We carry a large list of Knorr products from Germany. 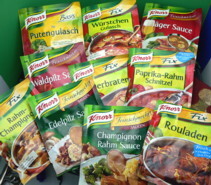 Here is list of our Knorr sauce mixes from Germany! Special Knorr Fixes for your specialty meals! Knorr Seasonings & Bouillon from Bavaria Sausage Inc.
A very nice selection of Maggi soups from Germany. Just add water and you will have a full flavored soup for 2! Maggi Fixes from Bavaria Sausage Inc.
Maggi Spices & Bouillon from Bavaria Sausage Inc.
Other Spices and Seasonings from Bavaria Sausage Inc.